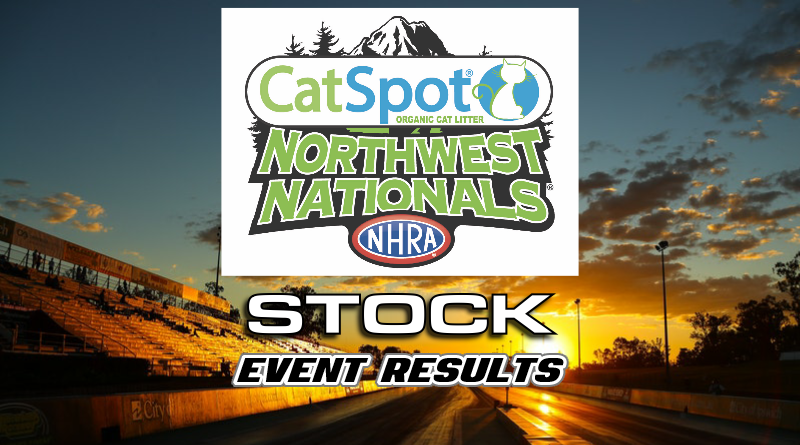 KENT, Wash. – Ryan Warter collected his first national event Wally at the CatSpot NHRA Nationals. Warter, of Olalla, Wash., drove his J/SA ’75 Pontiac Firebird to the win over red-hot Floyds Knobs, Ind. racer Randi Lyn Shipp. Warter’s win came in his fifth national event final round appearance. Warter averaged a .026 R.T. throughout eliminations while running dead on his dial in rounds three and four. Warter’s path to victory began with a round one defeat of Denver Mile-High Nationals winner and current Pro Stock driver Drew Skillman. Warter’s .016 to .058 reaction time advantage sealed the win as he killed .02 at the finish line to take .016 and go .023 above his dial-in. Skillman dropped a couple at the stripe to go -.003 under his dial in the loss. Warter picked up a double break-out win in round two against the AA/SA of Darcy Clarke. Clarke dialed up almost a tenth for the second round which proved to be his undoing. After gaining a slight edge off the line, Clarke grabbed too much stripe at the finish line (.033). Clarke did manage to scrub .04 to go -.041 under while Warter was more than happy to give Clarke the stripe. Warter dropped .03 himself at the stripe to go -.017 under his dial-in for the win. After pairing with two of the faster cars in the class in the first and second round, Warter faced one of the slower cars in the class in the third round when he met up with the U/SA ’94 Mustang of Rick Green. After an even start, Green’s Mustang picked up a tenth leading to a -.096 break-out pass while Warter made an all-out 11.705 on his 11.70 dial to take the easy win. In the fourth round, with a bye to the final awaiting the winner, Warter won his closest race of the weekend when he defeated Bill Bushmaker by just .006. Warter laid down .010 total on the all-out run (.007 R.T., dead-on with a 3) which narrowly defeated Bushmaker’s .016 package (.009 R.T., dead-on with a 7). After the semifinal bye run, Warter paired against Shipp in the final round. Shipp took a small advantage off the line (.017 to .019) as both driver’s posted solid reaction times but her ’67 Pontiac Firebird slowed down track posting 10.636 on her 10.63 dial-in. This left Warter enough room to scrub a few hundredths of E.T. to take .011 stripe and go .023 above his dial to collect his first national event win. Shipp’s final round appearance added to her already successful season that has included multiple final round appearances. Congratulations to Ryan Warter and his team on their first win. It’s been a long time coming.